Although we are still recovering from our 14-hour cooking fest that was Christmas Eve, we had an absolute blast and were proud of ourselves for successfully producing 6 courses for 11 people. It was EXHAUSTING, make no friggin’ mistake. We cooked from about noon till 7PM on Sunday and from 10AM till 5 on Christmas Eve day. The hardest part of the meal was the Fritto Misto because we were cooking on an electric stove (arrrrrrrrrr) and we only had one cast-iron pan (fried so much quicker and more evenly). I had a bit of a mini-breakdown during the fritto misto cooking because people were bumping me, talking to me, staring at us and doing the #1 most annoying thing you can do to a cook (now this was all my mother) saying, “Ummmmm, can you tell us when this may be done?” or “Are we any closer to eating?” SHEEEEEDDDDDDD UPPPPPPPPP!!!!! So, since there are lots of elements to our meal, I figured I would post one or two recipes at a time. Most of the things we made were not from recipes and just kind of happened so I’ll do the best I can with measurements. But, like I always say, cooking should not be all about recipes – recipes are like a bit of a helper but you should never feel like they should be followed exactly. Always taste as you go along and you’ll know whether you need to add more stuff. Thanks to my sister, Alison, we had one of those festive Christmas drinks that you always see in those dorky Christmas spreads in magazines or in those fake, made-up ‘party scenes’ on Michael Chiarello’s ‘Napa Style’. You know he doesn’t have that many different friends! And you KNOW people wouldn’t be having that much fun with him. Anywho’s, you know how much I hate on The Food Network, but this recipe comes from there. It also comes from a very annoying personality on TFN – Guy Fieri. Anyone with the name “Guy” can not be trusted. Anyone with a friggin’ goatee a different color than the hair on his head can not be trusted. ANYONE with a pinkie ring should NEVER be trusted!! But, you know what, even with a nerd-o, cheesy title like “Gingerbling”, this drink was very delish and not heavy like many creamy Christmas drinks made with eggnog. So, for my first posted recipe is one I can lift straight from The Food Network. God, I hope this never happens again. For the rim, combine all ingredients in a shallow dish or saucer. 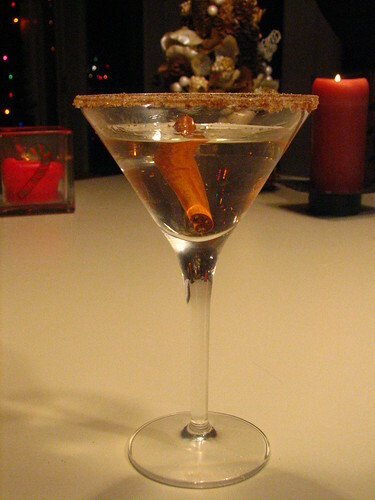 Wet the rim of a martini glass or tumbler with the slice of apple, reserve for garnish. Dip the rim of the glass in the sugar mixture and reserve. 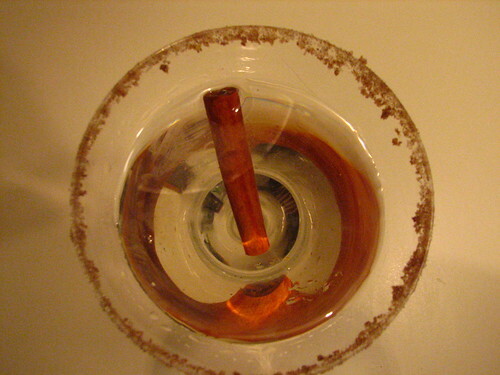 In a cocktail shaker, pour the cinnamon schnapps, vodka, and ginger ale over ice, shake and strain into the glass. Garnish with the apple slice. How can you be so cruel to someone you don’t even know …like Chiarello? I happen to know him and do know that most of the folks on his show ARE his friends….or folks that have purchased a spot during a charity auction to be there….why dont you try lightening up in the New Year?? Dork. Find another blog to read. Don’t you know that sarcasm is the key ingredient to any good food blog?